Easter is the start of my son's school holidays. Two weeks of freedom. His cousins are coming to visit too, so two weeks of freedom and NOISE! 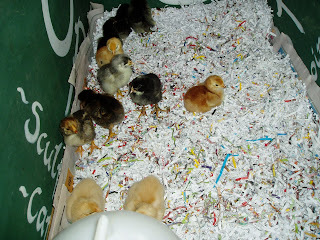 When school finishes we'll be bringing home the dozen school chicks with us. I lent my incubator to the school and the class above my son's got to look after it. 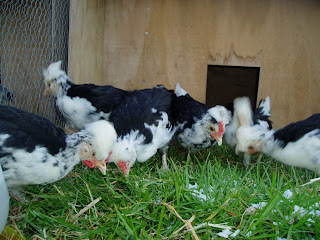 I set them up with fertile eggs (not my chooks) - Orpingtons, Plymouth Barred Rocks and Gold and Silver Laced Wyandottes. Each egg got named and the anticipation grew with each week that passed. 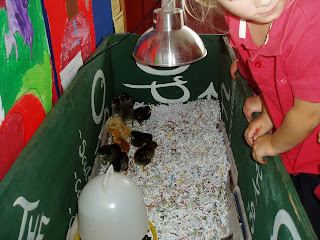 When the chicks hatched, the classroom was like grand central station. 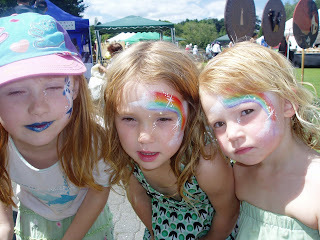 All the teachers, children, parents, EVERYONE found an excuse to come and oogle! Now the little darlings are about a week old and just gorgeous bundles of fluff. The kids are all in love and they've learned so much. One has a wee splint on it's foot to correct some bent toes. These usually occur if the humidity spikes or falls in the incubator and seeing as the teacher accidentally let the water reservoir run dry one day, this is most likely what happened. Once the holidays are over, I'll be taking them back to the school. Eventually the hens will go in the school chook run - unused at present - and the roosters will come home with us to be roasts. 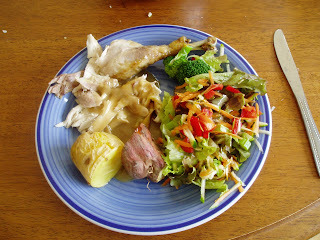 We're being honest about this with the kids, the whole exercise was to help them learn about life and food and roast rooster is just part of it. Speaking of chickens. These are my six week old Houdans. I moved them into an outside run over the weekend and they think grass is just amazing! Unfortunately out of seven, I have five boys and two girls. You win some and you lose some. Nrrggghh! The two doe bunnies I have boarding with someone I've never met (read about it here), just popped out 15 kits between the two of them. I guess my rabbit breeding program has started a little earlier than I expected. So what would you choose? A house cow or a house goat? I've been pondering that question for a wee while now. Of course, I've been pondering the bigger question too: "House milk-bearing animal at all?" My husband hates goats. With a passion. It goes back to a wild goat-cull he went on as a lad, got marooned and ended up having to eat half-cooked wild billy-goat....enough said. He reckons he can taste 'goat' in the meat, in the cheese, in the milk. Not that he drinks much milk anyway, he's a bit lactose intolerant. I've never had that much to do with goats, but they look pretty cute! They are also smaller, but craftier, than cows. Apparently they do a lot of escaping. Everything I've read says you need to have at least two because they are such social animals. 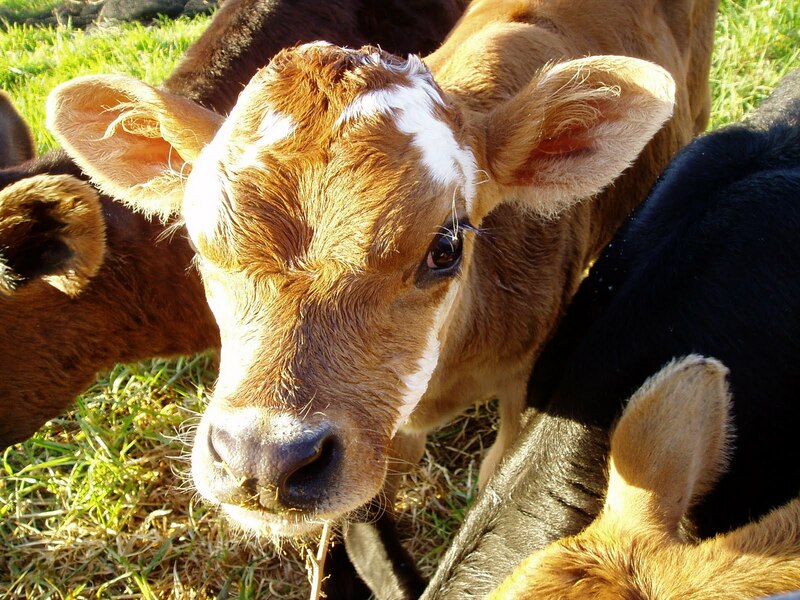 Then there is hoof trimming, shelter requirements and the fact that they never develop a resistance to internal worms. Cows are big. If one stands on your foot, you know about it. They also produce a heck of a lot of milk. But you can separate off the cream and make butter. Goat milk and cream doesn't separate very well. Cow's milk and it's products are more accepted than goat milk. Cows don't climb and eat trees (which we have a lot of young ones) and they don't need as much company as goats. But they are more expensive to buy and they take a lot longer to produce offspring. However, said offspring is easier to sell or eat. As for the time factor of everyday milking - well, I reckon that's ok. I'm not a highly motivated person but things that need to get done, get done. Like 'chickens will starve if I don't feed them' versus 'nobody will starve if the floor stays unvacuumed'. 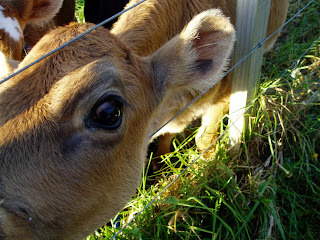 Also, if you keep the calf/kid with mum then just lock it away for the night or a few hours, you can go away for a night or two and not worry about mastitis etc. You also get a naturally reared animal - much easier for you and much healthier for them. The locking away thingy also brings up another point. I have no yards and no milking stand or crush. So the bigger the animal, the more expensive to build what I need. I have a wee jersey heifer called Gloria, but it will be another year before I can get her in calf and then another nine months before I potentially have milk - and I'm itching to get into it now. Oh so much to ponder!! I feel a little famous! 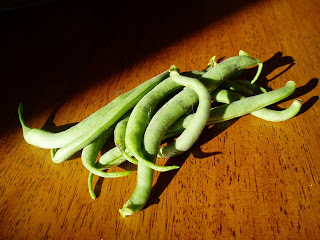 Rhonda, at Down to Earth, featured my kitchen (in all it's unholy glory) on her blog today. And so many nice people left wonderful comments! A few even came and visited me here - hello! Above is my bean harvest. My ENTIRE bean harvest for the year. I planted dwarf beans and the sparrows came and ate out the growing tops. I thought that that would be the end of it as it was getting too late for beans and the ones they ate wouldn't ever grow properly now...but lazy me never got around to pulling them out. A few brave plants struggled on and produced that little handful of green for me. Mother Nature never gives in. 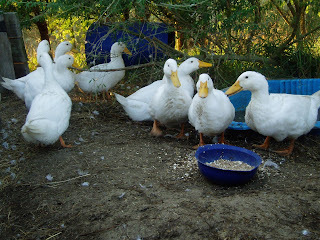 My husband has been looking at our ducks for a few weeks now and hinting, hinting.... But I've been loath to 'do one in' because I haven't been able to tell drakes from ducks. Drakes develop little curled feathers on their tails, but not for another few months. 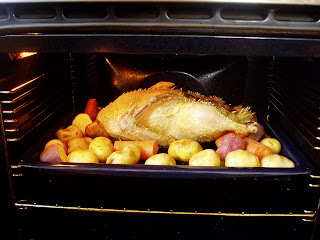 But last weekend we were doing a few other birds (roosters and the turkeys - RIP) and we decided to do a duck anyway. I've also been told that ducks quack and drakes wheeze/hiss. So I picked the biggest wheeziest one and that's him, above. If you look close, you can see our first problem we encountered. 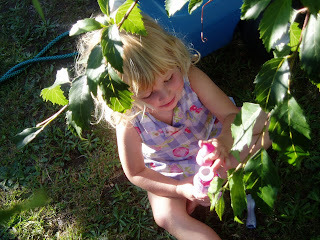 Major plucking. We had been told to cull them at 9 weeks to avoid their new pin feathers coming through. And they were right. Also, he was really, really fat. So I think we'll let the rest mature a little more to let their feathers come through for easy plucking and then when we get breeding properly, we will kill our eating ones at 8 weeks. This is a roast we had from one of our roosters. Nothing tastes like chicken again once you've had a homegrown one that you know had a good life and a quick death. Yum! If you are planning to kill and pluck your own birds, the best ever way we have found of plucking is the hot water trick. 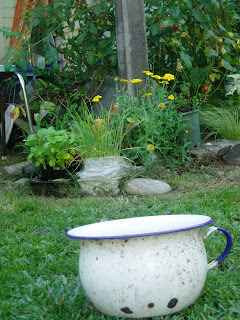 Heat up a big pot of water till it's about 68 degrees Celsius - or for me, too hot to put my hand in but not boiling. A squeeze of detergent then dunk for freshly killed bird in for a minute and get plucking. The feathers practically fall out (except from a 10 week old duck!). I'll tell you how the duck tasted tomorrow. I need to tell this little story just to prove that there are still good people in this world! 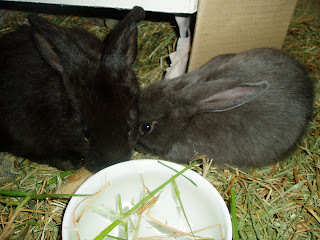 I bought two rabbits from a lady in Tauranga (a 14 hour return drive from here). I had timed it so that the Petbus (a pet transport service) would be passing her place in the couple of days after I finalised the purchase, only to find that the Petbus lady had decided not to go to Tauranga this month but go straight past and down to Wellington. Darn! The seller really wanted to get rid of the bunnies, but there is no way that I can fit in a 14 hour return drive. What to do? I tried to find another transport company - no go. Just a cute pic of my two wee girls I already have. Then someone suggested posting a notice on the Trademe community notice board. 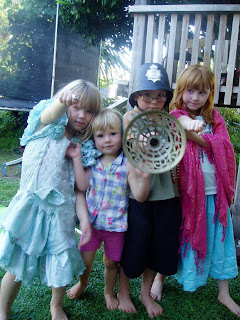 Trademe is like Ebay. And there is a section with lots of different threads of people asking questions, looking for help, or just chatting. Anyway, on the Rabbit Lovers thread (!) I asked if anyone was travelling north who could help me out with bunnies. Several messages backwards and forwards and my bunnies are now boarding with a lady in Paeroa who will then take them to Auckland at Easter when she goes to the Rabbit Show. 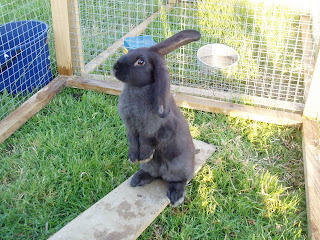 She is going to give them to a fellow bunny lover who is coming down from Whangarei for the show. They will then take them back up North for me to collect. How amazing!! These people don't know me from Adam, but they are prepared to go out of their way to help. I am paying the lady to board my rabbits, but a totally minimal price. And she still had to drive to a pickup point, etc etc. Have faith everyone, there are still wonderful people out there. We are down to quarter of a tank of water again. And next week's rain forecast looks mostly like the picture above - squat didley. 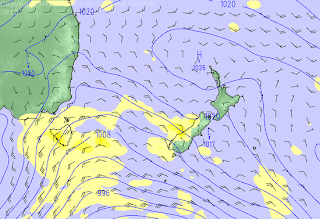 Maybe a few showers on Tuesday, but don't hold your breath. We have been really lucky so far. Our first summer out here on tank water and we have a drought, but always, just as we are getting lower than quarter of a tank and starting to contemplate buying water, it rains just enough to give us a few more weeks. The cows have finished their rotation on our paddocks and are back into the neighbours again, but his waterhole is looking precariously low, we may yet have to hose water to a trough for them. I recycle my shower water into the washing machine and water my veges with grey water. The car hasn't been washed for months etc etc. I know this is nothing like the droughts other parts of the world get, but for us, who aren't really prepared, it's hard work. Do a little rain dance for us, will you?! Duck breakfast. 10 weeks old and fully grown. Turkey breakfast. 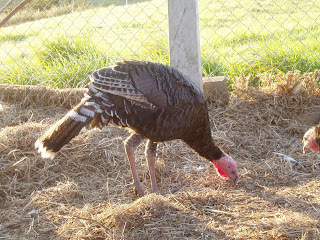 The turkey's think they are chickens and insist on being locked up with them at night. I don't mind, keeps it simple. Someone left me an early egg, still warm. Fluffy, doing her cute impression. An early morning stroll down the drive with the dogs (there's a tiny black speck in the gateway, it's a chocolate labrador). Wishing you all a lovely morning tomorrow. I have to write these down somewhere or I'll forget. My son, aged 5, came out with these pearls today. When given a photo that had come down off his old daycare's wall display, "Oh, has it been lemonaded (laminated)?" 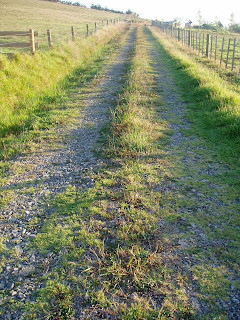 And, when driving home, "Careful Mum, this road has just been tarpaulined (tarsealed)." When we went to Hamilton recently, we stayed with my Sister in Law. She is a wonderful person, slightly eccentric, has a house jammed full of treasures and people and has three little daughters who are best friends with their cousins. I love her garden. It always inspires me when I go there. It’s nothing fancy, just a small backyard. But it is full of what I want for my place. 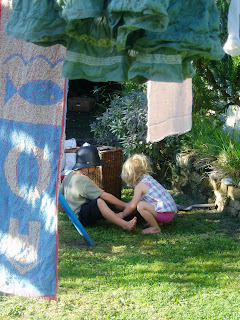 Little spaces, tucked away corners, a mix of vege gardens, lawn and rambling wilderness. It’s PERFECT for children to play in. Hidden nooks and crannies. A safe, sheltered haven. It's a little scary looking - but I'm actually really pleased with how it's turning out! My quilting buddy and I gave each other a challenge. 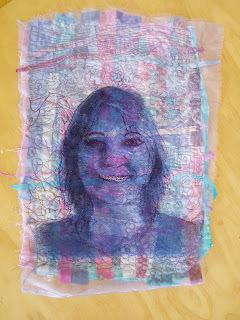 A self-portrait, A4 size, using whatever techniques you like but we must each use something that we bought from a quilting show that we both visited. I splashed out on luscious hanks of embroidery threads, some sari silks, a little bag of animal stamps and some silk rods. 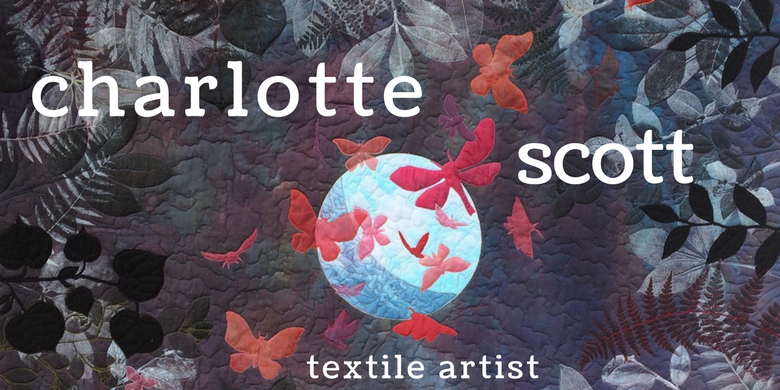 So far I have layered scraps of my favorite materials over a light piece of fabric and sewn them, grid style, in place. Then I layered chiffon over the top and free-motioned quilted different patterns (good chance to practice) heavily over the top. I then put a wash of white textile paint over the top to try and even the tone a little. The next step was to print out a large photo of myself in grey scale and use this to help me layer up pieces of tulle for shading. Then I traced the outlines of my face onto wash away and used this to help me free-motion stitch the lines of my face over the tulle. Getting there - except I still haven't used any of my yummy purchases!! What little works have you got in progress? 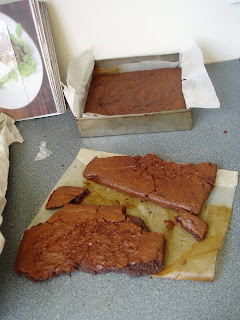 When making chocolate brownie, wait until it is cool before tipping it out of the tin. And use a rack to tip it onto, not your hand. You see, I was in a hurry and hadn't connected my brain. I tipped a very warm and soft brownie onto my hand to get it out of the tin and cut it up. Why was I in a hurry? Because I wanted to eat some. When making chocolate brownie, make a double batch! 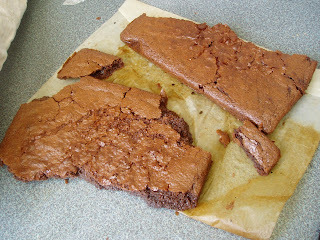 Find my chocolate brownie recipe here. I spent last weekend in Hamilton with the kids, hobnobbing with my sister in law and my nieces, so I’m in catch up mode. I even kept my wee boy home from school yesterday because he was so exhausted from the busy weekend. This is my Monday update on what I’ve done over the last week to move towards food independence. 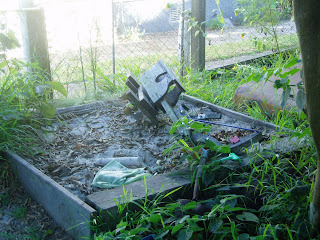 I originally read about it on Towards Sustainability and the original idea came from Sharon Astyk – read more about it here. Seeds of Palm Tree di Tascana Cabbage, De Cicco Broccoli and Joi Choi Pak Choi (this is proving SO easy to grow). Lots of eggs, mustard, courgettes. 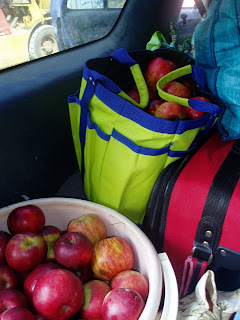 I was able to harvest free windfall Gravenstein apples from an orchard when I was in Hamilton – I picked up about eight big bags! 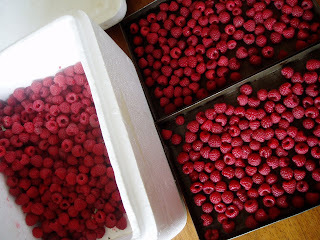 We also visited a pick-your-own berry farm and picked 2.6 kgs of raspberries, mmmmmm! Not this week, but I’ll be working on all those apples and raspberries next week! A yummy banana cake with some really old squishies and then the rest of the bunch went into the freezer for some future banana cooking. 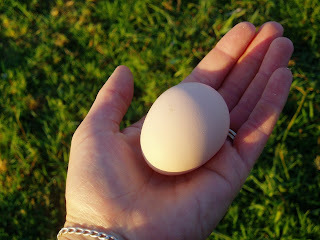 On my way home through Auckland I picked up a purebred Lavender Araucana rooster. 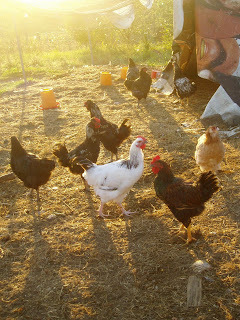 I’m figuring that my chooks produce eggs, manure and compost and do a great job of keeping down the bugs. But if I keep groups of heritage breeds, I can also sell surplus eggs and birds for a little extra in the kitty. I picked up my organics order from my friend and froze the extra seeds, milk powder and flour to prolong their life. Ummm. I did go to the Hamilton Garden’s show on Saturday. They had a permaculture area with lots of interesting stands and some speakers. 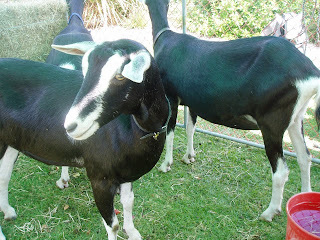 The kids made adobe mud bricks and petted the milking goats (I’m in love! ), the alpacas and the kunekune pigs. I picked up a brochure to join the NZ Treecroppers Association. Still not eating too much out of our own garden yet. 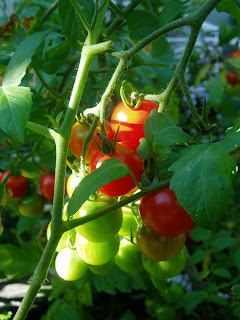 I feel I’m still getting the hang of succession planting and planting quick things as well as longer growing veges. 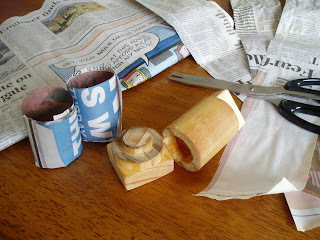 I learnt how to make seedling pots from strips of newspaper using this handy little gadget I bought from the Hamilton Permaculture Trust’s stand at the show. 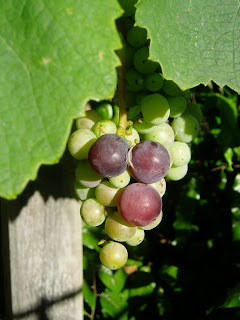 No more plastic punnets and they can go straight into the ground when they are ready as the newspaper just rots away. There we have it. Now I'm off to take the wee bunnies to the vet. I've come back to find they both have yucky scabby things on their ears and from what I can find out on line I think it's some sort of mite/mange. I'm learning very fast about rabbits!